The customer case manager dashboards are used to monitor the days since an incident was last modified with the goal to reduce the amount of time between customer interactions. These dashboards show you the age of an incident since the last time it was updated. The sections are broken down by pre-defined dashboards made up of teams and categorizations that group is responsible. You can click on any number to drill down and view an incident. Log into Cherwell Desktop Client using the blue Cherwell Service Management icon on your Desktop. Click on Dashboards and select the Dashboard Manager. 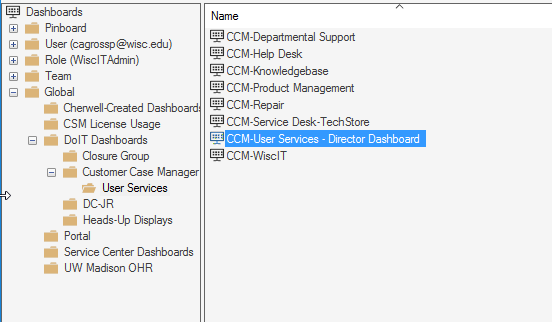 The incidents that make up these dashboards represent pre-defined teams and categories, email wiscit@doit.wisc.edu for updates to these dashboards. Open Prior 30 = current incidents that were created more than 30 days ago. Create Past 30 = Incident created within the past 30 days, regardless of status. Created & Resolved Past 30 = Incidents created within the past 30 days and resolved. Open as of Today = All open incidents as of today. Average Days to Resolution = average days to resolve an incident over the past 30 days. Days Since Last Modified = notes added, status change, email sent/received. <5 = Incidents that have not been modified less than 5 days ago. 5-14 = Incidents that have not been modified in 5-14 days. >14 = Incidents great than 14 days since they have been modified. Hold = Incidents that are in a Pending status with reason Scheduled or On Hold. Needs Attention represents Open incidents that the need attention flag is set to True. This section breaks down incidents by their category regardless of team ownership. This section breaks down incidents by the team that owns the incident. This section breaks down incidents by the owner, this section does not include unowned incidents.